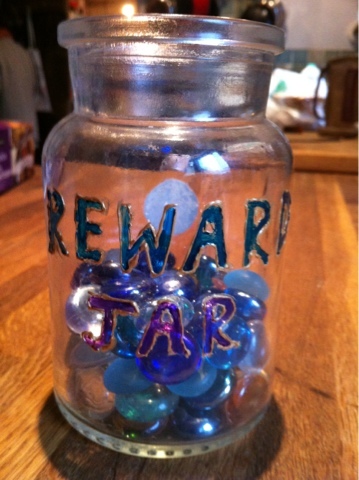 A simple way to reward your child's good behaviour is to decorate a pot or jar. We painted one for Blake with some glass paints, and every time he does something good, he gets a bead or two. If he's naughty, then usually the threat of taking some beads away is enough to change his behaviour. We have worked out a redemption system, where one bead is worth 10p. This has helped Blake to value and appreciate the cost of things he "wants", when he knows that will cost 10 beads, or this will cost 20 beads etc. Blake has been saving up all year and will be treating himself to something soon!